Editor: When we heard that our OBcean friend, professional drummer, Bill Ray, had been highlighted by The Reader for his expertise in freelancing in the music business, we had to get the hell out and over there to check it out. Hell, we know Bill – we know where he lives – we’ve had meetings in his cliffside apartment. Plus Bill’s partner’s Sara writes for us occasionally. Sweet. When the Art Institute of San Diego needed a guest with pro music experience to speak to one of their audio production classes on the subject of freelancing in the music business, they tapped Bill Ray, also known as Bill Ray Drums. The Art Institute of California at San Diego, on Mission Valley Road, bills itself as a “design, media arts, and culinary arts post-secondary school providing bachelor’s and associate’s degrees,” with disciplines ranging from advertising and audio production to culinary arts and fashion marketing. “The guy who heads the department, Joe Godfrey, I think he wrote the Oscar Mayer wiener song.” Godfrey’s proper title is Academic Director of Web Design & Interactive Media/Audio Production. So how, in the Bill Ray scheme of things, does one succeed in the business of music? He talks about a local venue nixing comp drinks for musicians. Bill Ray is 43 and lives in Ocean Beach. 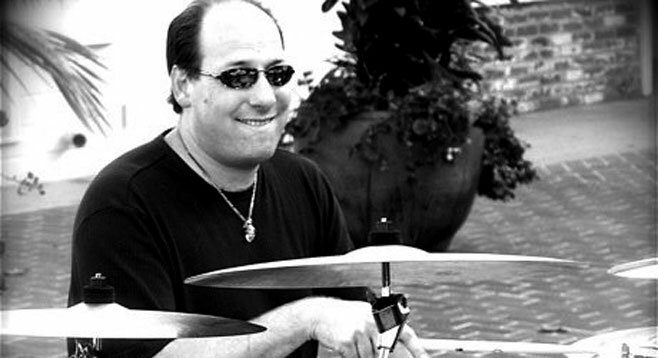 A veteran drummer born in Jackson, Mississippi, Ray also works a side job in web development and writes articles for Not So Modern Drummer magazine. But if Ray has freelanced the wrong way all these years, what, then, is the right way to be successful as a hired gun in the music industry? “I basically told them the devil’s in the details. What’s on paper…what sort of agreements you’ve forged. I’ve played on over 150 albums,” including Ike Turner’s 2007 Grammy-award-winning Risin’ with the Blues. “And almost none of them,” admits Ray, “were paperwork-documented. Most of the time, I worked like Hal Blaine and the Wrecking Crew,” meaning work-for-hire situations that pay a session fee but zero royalties.